Congratulations on your new home, and welcome to Lawson! We are so pleased that you have chosen to join this unique community that blends history and environmental preservation with a special sense of place and community. We are confident that you will find this area to be as special as we do. In modern cities, it is sometimes difficult to find a place to truly call "home.” We rarely know the roots of our land and community or feel a true sense of ownership where we live. In this respect, Lawson stands apart from other communities. Through painstaking research, we have discovered that Lawson was once an historically well-known township and commercial center of the eighteenth century. Enclosed you will find historical docu­ments written by the Trading Path Associations’ Tom Magnuson. This document details the early beginnings of this land. Indeed, Lawson is "a land set apart," and when you read this piece of history, you'll agree. We at Pace/Dowd Properties have gone to great lengths to preserve this area, its historical roots, cultural background, and environmental land­scapes. Collaborating closely with town leaders in Waxhaw, we worked to ensure that Lawson would be a pleasant living environment compatible with historic Waxhaw. We used advanced land planning techniques to preserve the natural woodlands and establish the street flow with existing topography, much like the original "trading path" network might have been laid out. A full 34% of the land is devoted to open spaces, including over four miles of interpretive trails, parks, and our one-hundred-fifty year-old Heritage Oak tree. We also employed native North Carolina plants in our landscaping, and used stone, specimen oak trees, and existing creek crossings to embrace our theme. Even our architecture itself follows that used by our predecessors on this land. We emphasize front porches, metal roof accents, and strict architectural covenants to reflect the Union County "clapboard" style farming homes. Pace/Dowd Properties has developed outstanding communities such as Kingsmead, Hunter Oaks, and Highgate, as well as other environmentally-sensitive living environments. Lawson is destined to become a magnificent community. Congratulations on becoming one of its founding residents. This report was prepared under a contract between Pace/Dowd Properties (hereafter Pace) and the Trading Path Association (hereafter TPA). Pace, desiring to name a development in Union County, North Carolina, after early colonial trav­eler, John Lawson, asked the TPA to certify the appropriateness of that name. Unfortunately, John Lawson's movements in the vicinity of Union County are simply not determinable. However, the TPA did agree to examine Lawson lands to determine if there were any artifacts of note on the land. This report summarizes the findings of that examination. The TPA and the report's author hereby express heartfelt appreciation to the following par­ties who were instrumental in the development of this report. First, the staff of The Heritage Room of Union County, NC, provided guidance and imagi­native research assistance for much of the material on Howard's Mill. A neighbor to Lawson, Mr. James A. Mullis provided information on "Five Forks," the hamlet that existed for a century or more where Lawson now stands. Eugenia and Larry Howard of Broome Mill Road, across the West Fork from Lawson, provided information on mills in the area, and Marjorie Howard, the last surviving member of the Howards of Howard's Mill, gave generously, of her time and memories of the area. J.Neal Robinson of Waxhaw, a Trading Path Association member, generously provided horses for a horse­ back survey of over five hundred acres. Finally, thanks must go to Stephen and Brian Pace for investing in an historic study of the land on which they intended to create home sites. Their patience, frequently tested, proved to be the most valuable contribution of all. B: Lawson's Approach To "Lawson"
WHAT THE LAND WAS BEFORE IT BECAME LAWSON. This will be a story of the land today called "Lawson." Lawson undoubtedly has had other names, most of which we will never know. At one time it bore the name of the nearest postmaster. Once it carried the name of its most prominent geographical feature, the intersection of five roads. But we will never know by what names it was known in ancient times to the Waxhaw, Catawba, Wateree and Sugaree peoples and their ancestors who hunted its slopes, farmed its bottoms, and camped by its springs. What the earliest frontier folk called it, we will never know. All we know with reasonable certainty is that, owing to its location on the forks of a major stream, 12 Mile Creek was a place of note and importance until the advent of modern transportation. He fulfilled his contract handsomely. His journal, published in 1710, is one of just a hand­ful of English eyewitness accounts of early colonial America. In one or another of its various editions, it is in print even today. His reward for services rendered was to be named "Surveyor General" for the Lords' Proprietors in the Carolinas. Shortly after publishing his journal, young Mr. Lawson was arrested, tried, convicted, and executed for land theft by the Tuscarora Indians. So it is that a small piece of land in Union County, North Carolina, in the 21st century came to be called "Lawson." Young Mr. Lawson passed through the land, stopped, and spent some time in the neighborhood, probably with Native Americans known to him as Esaus. He took the time to write about the land he saw and the people he met. Whether he dipped his moccasins in either the East or the West Fork of 12 Mile Creek we cannot say; yet, it is fitting that the land at the forks of 12 Mile Creek now bears his name. Before modern times, 12 Mile Creek was a major obstacle to movement. In flood it was too violent to enter. In dry weather, along its lower reaches and below its forks, (though passable by men afoot or horses) its bottomlands were too broad and soft for wagon passage. Native and European travelers would seek a shallow place with a solid bottom, called a ford, at which to cross a stream. In low water most pied­ mont streams could be forded at almost any point. However, even a small amount of rain rendered piedmont streams murderously powerful and utterly impassable along much of their courses. As water levels heightened, the traveler was forced to go farther and farther upstream to find a pass­ able crossing, or else wait for the waters to recede. As a rule, there were high, low and intermediate stream crossings. High roads far upstream were, used in wet weather, and low roads were used in dry weather. The middle ways were the most used, and they could frequently be found just above a major fork in the stream. Although the traveler had to cross two streams instead of one, they were two smaller streams rather than one large stream. This was a much safer alternative. The first fork on 12 Mile Creek is at Hancock, South Carolina, where 6 Mile Creek flows in from the northeast. At this point 12 Mile Creek has a wide valley, a "corn bottom" commonly used by Native Americans in the Late Woodland period for farming corn, beans and squash. Broad bottoms mean easy farming, but broad bottoms also mean hard travel. They frequently flooded and became impassable to almost any kind of traffic. In wet weather, a traveler would have had to go farther upstream to find a safer crossing. 12 Mile Creek has its second major fork just upstream from where Providence Road now bridges it, where the creek is actually formed by the merg­ing of its East and West Forks. The bottoms of the East and West forks are not nearly so broad as those found around the fork at 6 Mile Creek. Man and horse could easily cross either of these upper forks most of the time, and wagons could probably cross at all but the rainiest times. Thus, this fork was quite attractive for travel and trade, making it a popular route of the time. THE FORKS OF 12 MILE CREEK. TWO HUNDRED YEARS OF MAP REPRESENTATIONS. …accurately represent the backcountry with any sort of detail was drawn by a trader and soldier of fortune, John Barnwell (Figure 1, Left). This map is of particular interest not only because it is the first map to show fairly accu­rate details in the backcountry, but also because John Lawson may have had an early version of it during his travels. Barnwell and the other principles involved with Lawson and the map were all military mercenaries and active Indian traders. It is quite likely they would have had a sketch map with the location of their trade partners. It is equally reasonable to presume that, if they had a map, they would have shared it with the young man they sent into the wilds. On the portion of the map shown, the solitary dashed line marks the route taken to the "Waxaus" during one recruiting trip. It goes north of west from the great bend in the Peedee River where it changes from a northwesterly course to a northerly course. On current maps this same vector would mark a line from Cheraw, South Carolina, where the Peedee turns northward to the area known as the Waxhaws near 12 Mile Creek. Similarly, with few assumptions one can follow the dotted lines from the "Congerees" to the "Waterees," to the "Waxaus" by comparative measurements along the Congeree River and the Wateree River. On modern maps, it too brings you to the vicinity of 12 Mile Creek. …the publication of Barnwell's map of recruiting trips into the backcountry, one of the first maps to actually show 12 Mile Creek appeared. The map segment shown in Figure 2 (Right) is from the Faden Map, a map of the movements of Generals Cornwall’s and Greene during the closing months of the Revolutionary War. It clearly shows that 12 Mile Creek was a stream of note. With no forks by which to gauge a location , we can only surmise what road we see on the map. Yet, what is certainly true of 12 Mile Creek in 1781, when Cornwall is rushed to Charlotte seek­ing battle with his American adversary, was that it was significant enough to warrant inclusion in this nearly official map of Cornwall’s campaign in the south. By the end of the 18th century, roads in the vicinity of 12 Mile Creek began to take on mod­ern lines. In part, this resulted from increasing knowledge of backcountry geography. However, changing transportation technology also forced development of roads along lines suitable to chang­ing carriage technology. During the Revolutionary War, demand by both armies for draft animals was high. Draft horse breeding expanded to meet the demand such that there was a surplus of horses by the end of the war. One result was that wagon capacities increased to take maximum advantage of the increased avail­able horsepower. Loads became heavier, and this resulted in roads shifting upstream to easier stream-crossing points with firmer, narrower, and less-silted bottoms. …we can see the modern Lancaster Highway that passes through Hancock just below the confluence of 6 Mile Creek with 12 Mile Creek. Without a doubt, this is one of the oldest crossings of 12 Mile Creek. But the road through Hancock, in wet con­ditions, would have been impassable to a heavily loaded wagon. Hence, just prior to reaching 12 Mile Creek, near the "Crocket" place the high road veers off to the right and crosses both the East and West Forks of 12 Mile Creek further to the east. The place named "Huston," slightly southwest of Matthews, may well be the place later known as Union which is due south of Matthews. If so, then it is safe to say that in the late 18th century the high road over 12 Mile Creek passed through Lawson. The 1823 Tanner map (Figure 4, Right) gives evidence that stream names can change, for Tanner calls 12 Mile Creek "Five Mile Cr." This may reflect an error on the mapmaker's part, or it may indicate that the stream was known in different jurisdictions by different names. More important than whimsically changing stream names is the fact that this map indicates that Providence Road still did not exist, and that the "high road" over Five Mile Creek still ran through Lawson. This "Great Road" is one of the most persistent features relating to Lawson, and we will note that, though road and place names change, the actual track of the road persisted until quite recently. In fact, early in the 19th century, a pattern of roads begins to emerge that will, in time, give the land that is now Lawson a name. Like perennials, these roads appear for a season and then disap­pear again only to reappear anew at a later date on another map. We can see three of the eventual five roads com­ing together on the ridge between the West and East Forks of 12/Five Mile Creek (Figure 5, Left). Where these roads come together there is now a main entrance to Lawson. Of further interest is the fact that, though Providence Church appears on McRae-Brazier, Providence Road does not. Waxhaw still does not exist, and Matthews, by these mapmakers, was deemed unworthy of mentioning. As plank road popu­larity peaked and railroad development was all the rage, the roads had not changed much but a map by an anonymous mapmaker in 1854 (Figure 6, Right) showed mills and other details . "Huston" was now "Wolfsville" and 12 Mile Creek was still Five Mile Creek. The post office at what became Union changed hands back and forth between Hustons, Wolfs, and Winchesters throughout the 19th cen­tury, and with each change there was a change in the place name on official maps. On the line of Old Lancaster Road, the old high road, there now appears a mill. The owner's name, obscured by some post-production highlighting, was probably "Howie GM (Grist Mill)". Is that it demonstrates the diminishing importance of 12 Mile Creek in the middle years of the 19th cen­tury. (Figure 7, Left) Though not shown in the map segment used, the stream was then called "Twelve Mile Creek" and its unimportance is exemplified by the fact that there is no detail shown whatsoever. This may be attributed to slovenly map making but is far more likely a reflection of the commercial unimportance of wagon roads in the era of railroads. Road lines on the Cooke map, lacking any terrain context and showing few surface place names, appear to be mere schematic representations. Wolfsville has been transformed to "Wolfville," but at that place there are now four roads congregating where once there were just three. 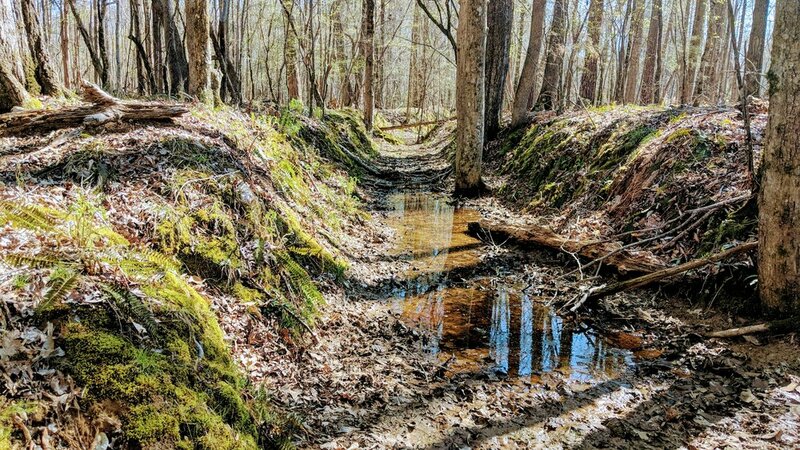 Generalized bridging of streams and the rapid expansion of railroads in the mid-19th cen­tury diminished the importance of fords over the East and West forks of 12 Mile Creek. Manpower shortages during the War Between the States did nothing to enhance the importance of that area. In fact the destruction of southern markets and trans­portation infrastructure wrought by the war, plus labor shortages during the war probably dissolved whatever importance the area once enjoyed. Providence while the US Coastal Survey map (Figure 9, Right), drawn at the end of the conflict, shows a transition to the modern road lines. Providence Road passes over "Twelve Mile Creek" beneath the junction of the two forks. A secondary road cuts through and makes a four­ way intersection in Lawson. 12 Mile Creek and the land that would become "Lawson" faded into the background after the Civil War. Statewide maps grew in detail around the growing industrial centers and left out detail around the older, less economically significant regions. The land between the forks of 12 Mile Creek fell into this latter category. Witness these late 19th century maps of the area. By the end of the 19th century, the forks of 12 Mile Creek appear to hold nothing of interest. However the mills and the village remained. There were mills on both forks of 12 Mile Creek, but only those on the West Fork were substantial enough to leave behind telltale traces on the land that would become Lawson. On a no-name stream feeding into the west fork from the north, just west of the Great Road, was a mill that operated right into the middle of the 20th century, Broome's Mill. At the point where the Great Road from Lancaster, South Carolina, to Charlotte, North Carolina, just upstream on 12 Mile Creek from the junc­tion of the creek that powered Broome's Mill, was Howard's Mill. It appears from marks on the land that the original mill consisted of headrace that cut across a neck of land on the north side of the West Fork upstream from the later, more sophisticated mill site. It also appears that, without note in the public record, Howards' family members probably operated mills at this seat continuously for three or four generations. There are hints in the public record that indi­cate that three Howard men of the third generation on 12 Mile Creek went off to the War Between the States, and that all made it home. One was appar­ently an invalid, for his name never appeared on the business, and he died an untimely death within a few years of returning from the war. The brothers grew their father's business well from a gristmill to a grist and wheat mill, and then to a grist, wheat, and sawmill. And impossible to predict the constancy of landmarks over time. In Figure 14 (Left), we can see one of the few representations of the Howard Mill just to the left of Cuthbertson Road. All else is overshadowed by the colossal print marking the "Colossus Gold Mine" just across the East Fork from what will become Lawson. Note that it is already "Howard's Old Mill." Seven years later, on a soil survey map, we can see a remnant of the Great Road and, perhaps most importantly, the location of a hamlet never recognized by map makers but long-known locally as Five Forks. At different times, all five of the roads that came together at Five Forks appeared on various maps but never before on the same map. Sometimes alone, sometimes with two or three others, but only on the soil survey map of 1914 do we see all the roads of Five Forks - until the moment Lawson redefined the land. In the early 20th century, the houses that remained around Five Forks had already aged and some were becoming decrepit. Despite the mapmaker's neglect, the hamlet had existed since colonial times, and it was showing its age. Using 19th century commercial directories, we can sur­mise just how noteworthy Five Forks was. For example, in 1867 Wolfville had: a min­ister (Wood Landy, Methodist); two mines (Davis Mine, and Cureton & Co's gold mine); a Postmaster (Thos. W. Redwine) who was also a physician; and Howard's Grist Mill. In 1869 the directory dropped the minister but picked up a merchant (G.D. Broon); the Howard mill is still the only grist mill listed in Wolfville. For no apparent reason, in 1872, Branson's located all Union County list­ings in Monroe. This is an unlikely evolution. Furthermore, we see S.B. Howard had a flour and corn mill that we can presume to have been in Wolfville and not, as listed, in Monroe. By 1884, although Dr. Redwine still practiced medicine at Wolfville, the Howard’s Mill was no more. In the place of the Howards, who had been merchants and millers between the forks for over one hundred years, R.A. Hudson advertised a corn, flour, and saw mill. It is likely he bought this complex from the Howards. Road map shows, all signs of Five Forks (Figure 16, Left), the milling opera­tion, and previously important old roads have disappeared. The road matrix looks much the same as it does today. By the 20th century, soil had been overused to the point of extinction, large mills had overtaken small ones, and cheap transportation had taken over. At this point, Five Forks persisted as little more than a memory. Gold mining turned sharecroppers into hourly labor even before the Civil War. By the latter half of the 19th century much of the land was already in timber, and former farmers had become miners and mill workers. That circumstance persisted until the development of Lawson. After the Second World War, agriculture had a second chance as many returning veter­ans used their GI Bill support to acquire farms. Unfortunately, the soil at Lawson was still not ideal, and small farming had become nearly obsolete. By the 1970's, most farms were being operated only as second income sources by factory workers. When Lawson came into being, Champion Forest had owned the land for some years. Although there are no longer any undisturbed archaeological remains in the area of Lawson home sites along the streams, there are still numerous artifacts of early settlement and of the milling heyday of 12 Mile Creek along the streams. The headraces and tailraces, some foundations and other features remain from Howard's Mill. Though badly disturbed by sewer line excavations, the abut­ments used to anchor the dam for Howard's Mill and perhaps for an earlier mill will be revealed by careful study. Across the stream from the Howard's Mill races lies another millrace remnant that predates the Howard's Mill of the 19th century. The earlier mill may have used the same dam site as Howard's Mill, but it was located on the north bank of the West Fork. At the point where Howard's Mill evolved, the West Fork of 12 Mile Creek ran into a stone outcrop on its south bank. This provided a good fording point and an anchor point for a dam. The rigid stone forced the stream course to bend sharply to the right at this point. On the inside of the bend on the north bank, the water moved slower than on the outside of the turn and thus dropped its silt. Eventually, a small alluvial plain grew across from the rock outcrop. The first millwright to develop this site used a race cutting across the silt plain to make his wheel turn. He cut a trench through the silt, and he probably lined the excavation with a wooden box. In less than two hundred feet of race, the miller picked up a waterfall of over ten feet. His mill probably employed an undershot wheel and may have lasted for several decades before the wooden trough that was his race rotted beyond repair and needed to be rebuilt. Perhaps the greater availability of slaves and the expanding markets justified a larger invest­ment. Whatever the case, the later mill was built on the south side of the West Fork and required its builders to cut the races out of solid rock. Some of the races succumbed to excavators when sewer lines were laid along the creek. However, the devel­opers of Lawson, recognizing the importance of the mill remains, stopped and rerouted the excavations to minimize the impact on the old races. Thus, today the hiker can stop and imagine the process of growing the Howard Mill from a Grist Mill in 1867 to a grist, flour, and saw mill in 1882. Each product of the mill had its own race and all remain to be admired. John Lawson traveled from Charles Town to the falls of the Santee River by canoe. His course up-country, east of the Santee River, started after he ferried over a great flood near Huguenot lands below the forks of the Congaree and Santee Rivers. It is likely that he was never far from the Santee­ Catawba River thereafter in his climb into the backcountry. But, owing to his silence on the mat­ter, we must doubt he ever knew this fact. Lawson did not mention the Catawba River when he was in the vicinity of 12 Mile Creek, and he was quite good about naming major waters he saw or crossed. Thus, we can surmise that the people he visited in the Waxhaw country were on Catawba tributaries. Specifically, we believe from his journal entries that his Wateree hosts lived on Waxhaw Creek in what is now Andrew Jackson State Park. Lawson left his Wateree hosts to spend a night in a village a few miles away which most authorities take to have been in the vicinity of Van Wyck, South Carolina, just over a mile from the Catawba River on 12 Mile Creek. But Lawson says nothing about water in the vicinity of his Waxhaw village and concentrates instead on the sexual mores of his host people. He could just as easily have been anywhere along the south side of 12 Mile Creek. South of that creek were the smaller Siouan tribes, and Catawba Indian claims traditionally started at the north bank of the Creek. HOWARD'S MILL REMNANTS AT LAWSON. At some point in the development of Lawson, the Howard's Mill site will be incorporated in the matrix of Lawson hiking trails. With good fortune the old roadbed from Five Forks down to the mill will survive as well. …in the surveys repre­sented in these maps were found under less than ideal circumstances, and it is expected that closer examination of the terrain in the vicinity of the old mill site will produce a more detailed picture of the mill's evolution and operation. The "Great Road" crossed the West Fork immediately at the mill dam in the vicinity of the point where the races almost touch the stream by the first mill site. MAPS CONSULTED IN THE STUDY OF LAWSON IN CHRONOLOGICAL ORDER. Map of Carolina showing the marches of Colonel Barnwell, 1721/1715: This is a photocopy of a map that appears to be related to a pair of maps described William P. Cummings in The Southeast in Early Maps, Third Edition, Revised & Enlarged by Louis De Vorsey, Jr., Chapel Hill: UNC Press, 1998 as "Barnwell ca. 1721 MS" (map 184, page 218) or "Barnwell-Hammerton 1721 MA" (map 184A, page 218), but it is distinctly different from either of these in many respects. It bears the stamp of "Her Majestys State Paper Office" and appears in all regards authentic. The original resides in the Colonial Office Collection of the British Public Records Office in London, England. Faden Map of Cornwallis and Greene, 1785: The Marches of Lord Cornwallis in the Southern Provinces, now States of North America; Comprehending the Two Carolinas, With Virginian and Maryland, and the Delaware Counties, by William Faden, Geographer to the King. Published Aug 3rd, 1785. Price-Struthers, 1798: The First Actual Survey of the State of North Carolina, by Jona Price and John Struthers, 1798. Price-Struthers, 1808: update of The First Actual Survey of the State of North Carolina, by Jona Price and John Struthers, 1798. Tanner Map, 1823: Map of North and South Carolina, by H.S. Tanner, Philadelphia, 1823. Anon, A New Map of the State of North Carolina, 1854: A New Map of the State of North Carolina Constructed from Actual Surveys; authentic; Public Documents and Private Contributions, Published under the Patronage of the Legislature, W. Williams Map Engraver, Philadelphia. Anon, A New Map of the State of North Carolina, 1856: A New Map of the State of North Carolina Constructed from Actual Surveys; authentic; Public Documents and Private Contributions, Published under the Patronage of the Legislature. Wm D. Cooke Map, 1857: Cook's New Map of the State of North Carolina Constructed from Actual Surveys; authentic; Public Documents and Private Contributions, Prepared for the Purpose Under a Special Resolution of the General Assembly of the State by William D. Cooke, A.M., Principle of the North Carolina Institution for the Deaf & Dumb, and Blind, 1857. Colton Map, 1861: J.H. Coltons Topographical Map of North and South Carolina, a Large Portion of Georgia & Par of Adjoining States, Published by J. H. Colton, 172 William ST, New York, 1861. US Coast Survey Map, 1865: Untitled map of North Carolina, Southern Virginia, and parts of Georgia and South Carolina, made by U.S. Coast Survey, A. D. Bache Supd’t., 1865 . Johnson Map, 1872: Johnson's North Carolina and South Carolina, Published by A.J. Johnson, New York, 1872. Gray Map, 1883: Gray's New Map of North Carolina and South Carolina, by Frank Gray, Published by O.W. Gray and Son, Philadelphia, 1883. Gray Map 2, 1886: Gray's New Map of North Carolina and South Carolina, by Frank Gray, Published by O.W. Gray and Son, Philadelphia, 1886. Century Atlas Map, 1897: The Century Atlas, North Carolina, New York: The Century Co, 1897. Union County Map, 1907: Map of Union County, N.C., Drawn by C.M. Miller C.E. Salisbury N.C., 1907. USDA Soil Survey, 1914: Soil Map, North Carolina, Union County, U.S. Department of Agriculture, Washington, D.C., 1914. There is an excellent biography of John Lawson to be found in The Dictionary of North Carolina Biography, edited by William S. Powell, Chapel Hill: UNC Press, 1979-1996, Vol IV, pp 34-35. A search of the Internet using any search engine will also bring up several encyclopedia articles as well as the full text of his History of North Carolina. Supplementing any biography, one should read Marjorie Hudson's article "John Lawson and the Warring Nations: a Meditation on Images of Terror and the Other" in North Carolina Literary Review, November 11, 2002, pp 20-23. John Lawson wrote but one book and that is A New Voyage to Carolina; containing the exact description and natural history of that country: Together with present state thereof. And a Journal of a thousand miles, travel'd thro' several nations of Indians. Giving a particular account of their customs, manners, etc. by John Lawson, Gent. Surveyor-General of North Carolina. London: Printed in the year of 1709. It has since been reprinted and edited and commented on numerous times. It is generally available in used bookstores, particularly in the southeast. Travel, particularly commercial travel, has experienced substantial changes in technology but little change in economy. Commercial travelers in pre-modern times, as today, tried to not waste time or resources. Commercial carriers, be they porters or packhorse men or operators of eighteen wheeled behemoths have always and will always avoid: trav­eling without cargo ("deadheading"), needlessly risking cargo or rig, stopping more than necessary, or paying more for fuel and repairs than is abso­lutely necessary. Changes in technology increased speed and cargo capacity. Porters can carry tens of pounds; packhorses can carry hundreds of pounds, and wagons can carry thousands of pounds. Yet all pre-modern terrestrial cargo transportation trav­eled at roughly two and one half miles per hour. In the piedmont, that equated to approximately fifteen to twenty miles per day. Owing to the geography of the southeast, backcountry rivers were seldom a means of transportation and generally an obstacle to movement. In fact, early roads of the southeast, above the fall zone, moved from stream crossing to stream crossing and settlements grew up on them at predictable distances, a day's travel apart. Lawson arrived almost at the end of the Contact Period, the moment when Europeans met Indians. In the English context, initial contact occurred in 1585 and, east of the Appalachian Mountains, it was over by 1800. The Native Americans in the English parts of the southeast at that time are known, academically, as Late Woodland Indians. There were three basic groups of Indians divided by their languages: Iroquoian (Tuscarora and Cherokee), Algonquian (encompassing the Indians of the coast and sounds), and the Siouan peoples of the pied­mont. There are several good books available on these folk and this moment. Perhaps the most cur­rent and accessible of these is: The Transformation of the Southeastern Indians, 1540-1760, edited by Robbie Ethridge and Charles Hudson, Jackson, MS: University of Mississippi Press, 2002. There is no mention in Lawson's journal of his having access to a compass during his journey. It may be that compasses were not generally used in navigating through the backcountry owing to high iron content in some soils. Whatever the reason, Lawson's sense of direction seemed to fail him from time to time, and no device served to correct him. By deed found in Union County Deed Book 6, entry 155, R.G. Howard gave to S.B. Howard in 1859 ('a gift for love and affection') a tract of land on 12 Mile Creek lying "on both sides of the Great Road," "...crossing the Charlotte road..."
Gold mining was ubiquitous around Lawson for over one hundred years. In the early years, the mines provided 'off-season ' employment for the area's farm laborers and tenant farmers. Gold mines in the immediate proximity of Lawson include: Howie (previously Colossus Mine); Lawson; Big Survey; Wyatt; Bonnie Belle; and Washington. Government control of gold prices put the mines out of business around World War II. After the Revolutionary War and through the first half of the	19th Century there were numer­ous attempts to improve transportation in the interior of America. The piedmont, in particular, needed such "internal improvements," as the near­est market ports for commodities	grown in	the backcountry were either Charleston or the ports of Chesapeake Bay. All were about equidistant from Union County. So, in the early part of the 19th century there was a flourish of "plank road" build­ing to channel produce into Wilmington. Of course, the big change that marked the boundary between pre-modern and modern transportation was the development of internal combustion engines, start­ing with steam engines in the 1820s. Howards abound in North Carolina records. The family associated with Howard's Mill has been part of the public records of Anson, Mecklenburg, and Union county since at least 1755 in which year James Howard witnessed an estate in Anson County. William, probably his son born in 1763, fathered: S.B. Howard, William D. Howard, and Robert Fulton Howard. All three names appear on deeds associated with Howard's Mill, 12 Mile Creek and Sandy Ridge Township. At the time of this writing, Margie Howard, the last of this line of Howards, resides in the family home, a National Register structure on Providence Road, near Weddington. Branson's North Carolina Business Directory: containing facts, figures, names and locations, revised and corrected annually , Raleigh, N.C.: Branson & Farrar. 1866-1896. This directory, found in many genealogical research rooms, is invaluable for understanding social and economic history on the local level. It is organized by County, then pro­fessions, and then community. Thus, a list of all the lawyers in Union County will tell in what com­munity a certain lawyer practiced. Archaeologists have looked at both the East and West Forks of 12 Mile Creek as prelude to installing sewer lines. There is another archae­ologist's report on record related to the cemetery located on the eastern boundary of Lawson. The findings of the examinations of the bottoms indicate the long-term presence there of Archaic Indians. All studies are public documents residing in the State Archaeologists Office, in Raleigh . Sioux Indians possibly came to the south­ eastern piedmont as little as three hundred years before the European invasion. They occupied the piedmont between the the Iroquois of the coastal plain (Tuscarora) and the Iroquois of the moun­tains (Cherokee). Slaving among Native Americans changed character from a ritual activity to a commercial activity when Europeans discovered a market for Indian slaves in the Caribbean Islands. Raiding for slaves may have done more damage to Native American populations than did disease. One result of this raiding was that by 1700 most tribes of all three language groups persisted only as vestiges of their former strength. In a time when strength and value were measured in terms of "bowmen," this was disastrous. Survivors rallied together to muster enough strength to defend against raid­ers. They increasingly lived in palisade villages on high ground rather than in open, distributed towns near their corn fields. The Catawba lands west and northwest of Union County became a rallying place for decimated Sioux peoples. The Research Laboratory for Anthropology and Archaeology at the University of North Carolina at Chapel Hill is currently engaged in a project to uncover evidence of this moment in the remains of Catawba towns west of Lawson.